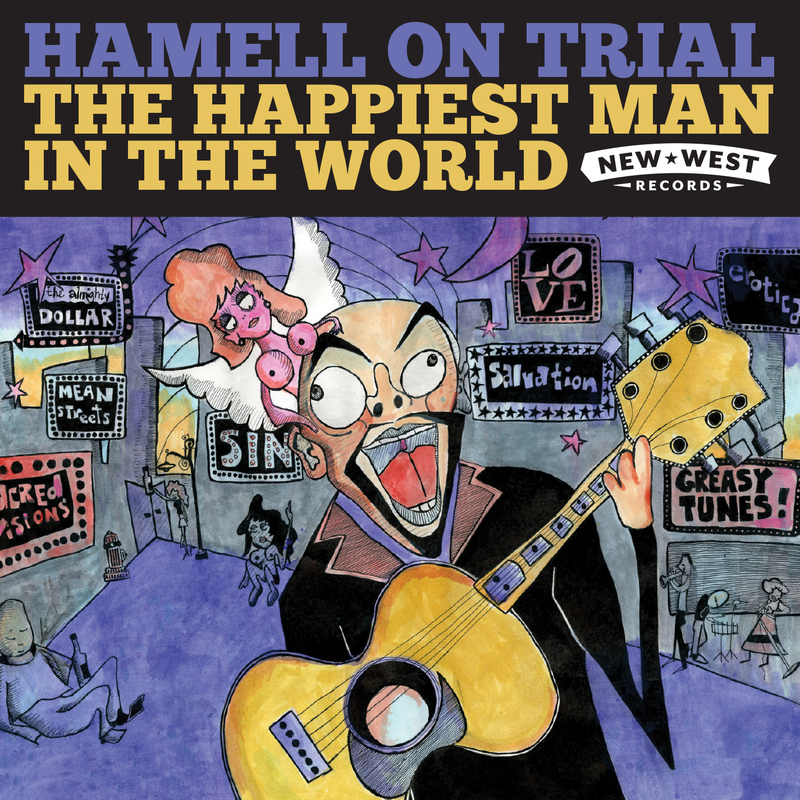 No audio recording can thoroughly capture the electrifying persona, frantic humor, wildly politicized indignation and sheer caffeinated motor mouth creativity that is Ed Hamell’s, aka Hamell on Trial, live show. Alone with only a battered amplified acoustic guitar and his fire spouting verbal assault, it’s a breathless non-stop barrage akin to getting sucker punched by a scrawny prize fighter. But this, his first studio album in nearly six years, gets pretty close. Punk poet, anti-folkie, humorist and obscene joke teller all partially describe the hyperactive Hamell. But above all he loves rock and roll, a point made clear as he spins off dozens of song titles in this disc’s opening salvo “Artist in America.” It’s one of the primarily solo, unaccompanied tracks that comprise about half this set’s playing time. On the rest, Hamell gets help from a band that adds sharp accompaniment, changing the vibe and giving Hamell’s lyric heavy tunes extra wattage, not that they need it. Stark New Orleans styled horns, Kimya Dawson’s girlish vocals and gasp…programmed drums help “Together”’s bittersweet tale of an old couple slogging through their senior years. Things get even odder as cello and electric sitar enhance the frisky folk-pop of “Lappa Oo Mau Mau” and when his teen son Detroit chimes in for spoken vocals during the sexed up “Mom’s Hot,” especially as we find that Mom is in a wheelchair, has a prosthetic leg and maybe a mastectomy. Only Hamell could pull that off without offending everyone, which is the crux of his genius. There’s also a tender side to him, evidenced by (parts of) “Jennifer’s Stripping Again,” the tale of a financially strapped older women who goes back to her old profession and includes the line “I hope she’s not here next year,” which can be read in a number of ways. Hamell gives religion a dressing down in “Gods at Odds,” a tune that begins as a ballad then morphs to speedy rockabilly. Musically the jumpy folk songs wrapped with blues, rock, pop and melodies are little more than vessels to carry Hamell’s stiletto edged words. But that’s enough for this to be a powerful and revealing introduction to a guy whose full talents can only be experienced in concerts where he really lets loose, using the audience as part of the act and leaving fans and newcomers raving, telling friends what they missed.